September 7th 2015: After stumbling, losing two of three games in Miami, the Mets had also lost 2 1/2 games in their lead in the NL East. Terry Collins first place Mets (75-61) came to Washing DC to face Matt Williams Nationals (71-65) for a Labor Day matinee. The Nats arranged their pitching staff so their ace Max Scherzer would face the Mets in the opener, the Mets sent the struggling Jonathan Niese to the mound. Today the Nats faced a much different Mets team then they had known earlier in the season. In the 2nd inning, two of the Mets "new comers" helped put New York on the board, as Rookie Michael Conforto hot a solo HR (his 6th HR of the season) & veteran Kelly Johnson added another making it 2-0. In the 4th Yoenis Cespedes hit a towering Dave Kingmanesque HR into the flower pots in left field, putting the Mets up 3-0. For Cespedes it was his 31st HR of the year, his 13th as a Met & his 30th RBI as well. In the 4th inning, Jonathan Niese fell apart once again, loading the bases with a pair of walks & then giving up a grand slam to Wilson Ramos. After blowing the lead he served up an RBI double to Werth putting the Nats up 5-3. Neise has now allowed the most five run innings in Mets history, now including the last three. He's lucky to get a bullpen spot if the Mets do get to the post season, he has been horrible. 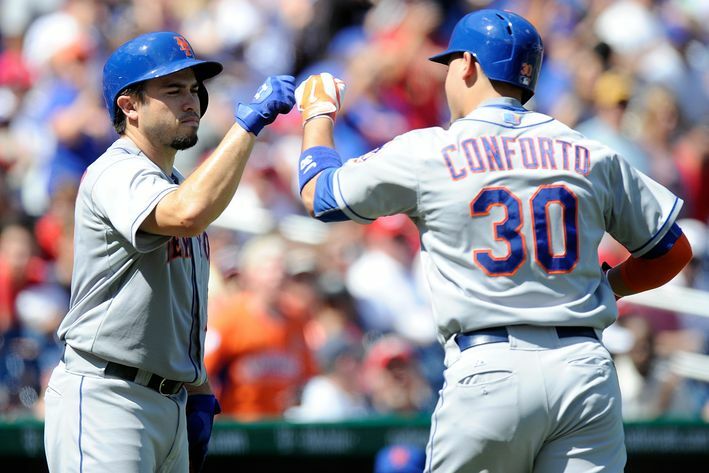 In the 5th the Mets fought back, Ruben Tejada got a hit & was driven in by Curtis Granderson. In the 6th Cespedes doubled and then danced around second base, distracting Scherzer enough to balk. With Cespedes on third, Travis d'Arnaud hit a sac fly to left field that Jason Werth had to slide to catch. He never had a chance to throw out Cespedes, as the Mets tied it up at five. In the 7th the Mets got Tejada & Granderson on base. 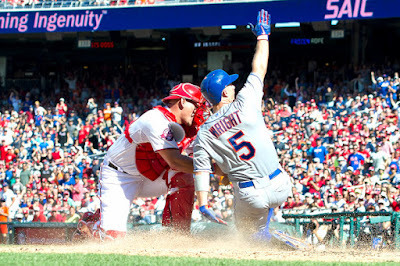 David Wright had maybe his biggest hit in eight years, as he singled to center field scoring Tejada. Wright, as well as us fans, has been waiting eight long years for the Mets to be in a pennant race. Next Cespedes continued his big day & hot hitting driving a base hit to Bryce Harper in right. 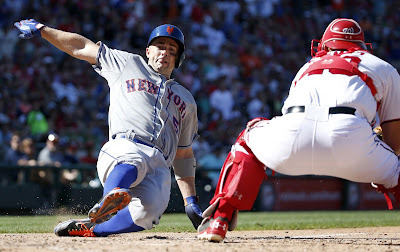 There was a play at the plate as David Wright gave a good old fashioned slide into the plate, making it 8-5 Mets. He let out a loud safe call himself & showed some happy excitement on his way to the dug out. 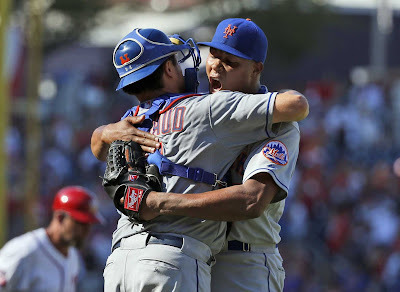 The Mets bullpen were super as well, Eric Goeddel threw a scoreless inning & then Carlos Torres did a fine job until he went out of the game with a calf strain. In that 6th inning, after Torres left the game, Dario Alvarez made his 2015 debut & struck out Bryce Harper after he had fallen behind 3-0. Alvarez was the pitcher of record & got his first win. Hansel Roebles has everybody thinking about his quick pitching & has shown he cane pitch in big situations. He was perfect over two innings, while striking out four. In the 9th Jeurys Familia got his 37th save, as he struck out Anthony Rendon, Bryce Harper & Ryan Zimmerman. 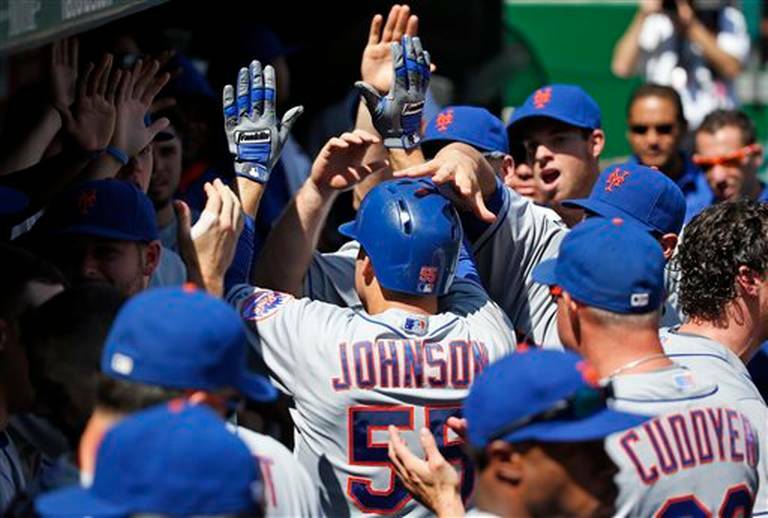 The Mets lead the NL East by five games over the Nats.